2019-20 Pre-enrollment has begun. Morning classes are filling up fast. For children who have turned five by September 30th, have completed a four-year-old program, and would benefit from delayed kindergarten entrance. Rather than have these children repeat a 4's program, we offer all new units and themes with a deeper concentration of skills that are developmentally appropriate. This program reviews and refines the fundamental skills taught in our 4's program and offers opportunities for growth and maturity and fine motor skills. We increase attention span, the children learn numbers 0-20, letter identification, independent work, comprehend 2-3 step directions, penmanship abilities are increased. We explore several math concepts; graphing, money, time, linear measurements and weight. The children have the opportunity to use math tools to solve problems. 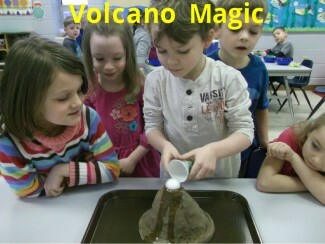 We develop a better understanding of science concepts through hands-on activities and teacher directed experiments. Social studies is addressed throughout the school year -by incorporating thematic units about selfawareness, being a good friend, exploring geographic concepts, mapping skills and studying the world around us (past and present). We also offer a revolving library where the children can sign out emerging reader books. We model reading and have a listening center which exposes the children to taped stories. Reading skills are developed by introducing rhyming words, nursery rhymes and word families. Concepts taught in the Young 5's program follow the State preschool Standards and exceeds the expectations and requirements of local kindergarten programs. Student-Teacher ratio 11:1. Maximum class size is 20. The Young 5's program is a four day program; mornings or afternoons. PM (afternoon) preschool has the same schedule of activities except its program begins at 1:00. 9:30 - 10:15: Center Time - 3 to 4 centers, children rotate to each station every 15 minutes. Copyright © 2019 Wishing Well Preschool. All Rights Reserved.